This collection has contained up to four examples of Soleil microscopes, which is remarkable considering their rarity. I am aware of only a few others scattered over the world. One of the four originally in this collection is not presently. As noted in the historical information listed below, only a few microscopes known to be produced by the Soleil firm are in known locations. Other examples are certainly of interest. The first instrument, no longer in this collection, is all brass, and has three stacking lenses. The optical tube is a cylinder with a cone-shaped taper at the end. It has only a fine focus mechanism, the adjustment knob at the bottom of the stage, acting on the stage through the limb. Focusing is achieved via a brass tube over another, and a screw through the outer tube rides on a slot in the inner tube to maintain alignment during adjustment. The focusing knob at the bottom acts to raise or lower the stage acting on a sprung fitting to keep the mechanism tight. There is a conical aperture diaphragm built into the stage. It is signed by a crude stamping to the arm in block letters: 'SOLEIL.' The skin-covered box measures about 4 3/4 inches long x 2 inches wide x 1 inch high(closed). It is lined with cushioned reddish-purple silk on the inside lid and on that lid is a gold stamp reading: 'Soleil rue de l'Odéon PARIS.' It has a small stage with two stage clips. There is a small compartment in the case which would accomodate slides of narrow width, and another shorter compartment for an unknown accessory, possibly cover slips or a magnifier. Another identical example of this microscope and its case, is part of the Whipple Collection at Cambridge, England. It seems clear that this instrument was being produced by Jean Baptiste Soleil by 1841 (see below). 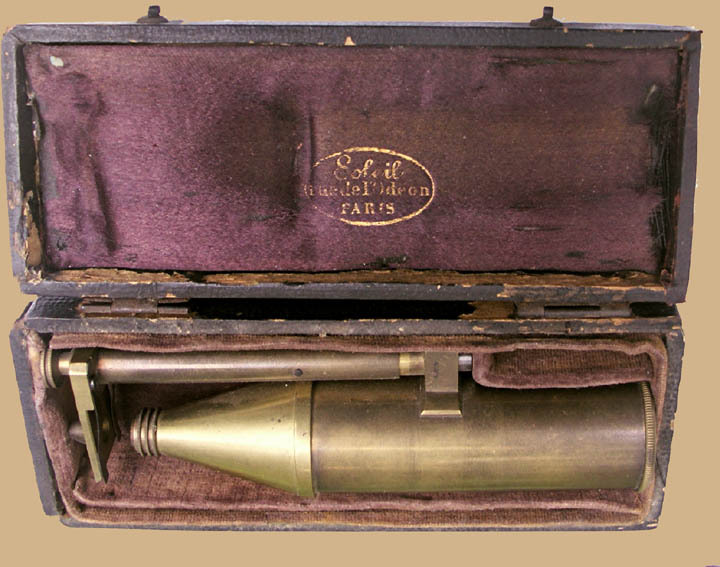 The second instrument, still in the collection, is strikingly similar, except the case has no name imprinted on the inside lid, the instrument is unsigned, and the nose of the optical tube is a tapering curve instead of a cone-shape. The other features are all virtually identical to the first, including the focusing mechanism and dimensions. The third example, dating to before 1851, is nearly identical to the first, but is signed on the optical tube: 'Soleil, RUE DE L'ODÉON, 35, À PARIS.' and in addition, is attached to a stand with an oxidized brass lead-filled base, and mirror. The word Soleil is larger and is in script, the address is in capital block letters, and À PARIS is in italic. This was the address from 1825 until 1851 when the address changed to number 21. The microscope inclines but the mirror remains fixed on the stand below, allowing the microscope to use another light source directly. The mirror can be used only if the microscope is in the fully vertical position. There are three divisible button objectives. The focusing mechanism is again the same as the examples of pocket models which are not fixed to a stand. This is likely the exact model referred to in the quote below. 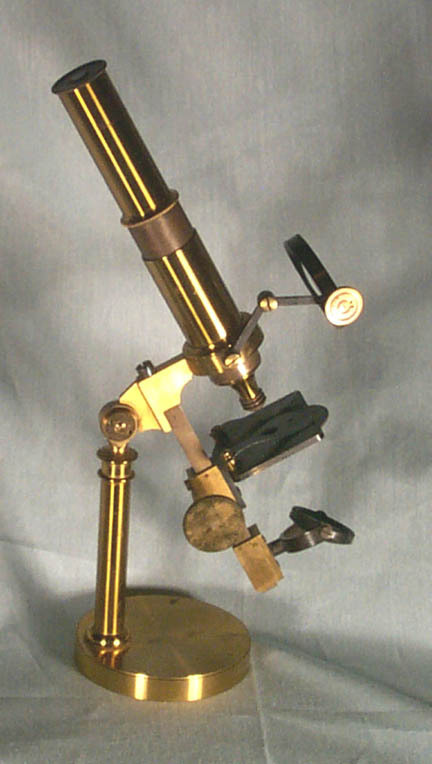 The fourth Soleil microscope shown here is a table model dating to after 1850. The tube has a slightly different signature to the pocket example on stand: 'Soleil, Rue de l'Odéon, 21 Paris.' In this case, the entire engraved signature is in script, and in the same font, but with the first letter of each of the words capitalized (except for de of 'de l'Odéon'). This is the later address, and Soleil was first here in 1851. Note that the À before Paris is also not part of this signature. The fine case with lock has no markings. The optical tube-supports in the case are attached to the cover of a small compartment for additional accessories (none extant). The case also has provisions for additional accessories including an additional eyepiece and dissecting instruments, but none are currently with the microscope. The microscope, which can incline on its supporting pillar, has both a substage mirror, and a bullseye condenser on a swinging arm, mounted to the ring on the arm encasing the optical tube. Focusing is by rack and pinion acting on the stage, although coarser rapid focusing could also be accomplished by sliding the optical tube up or down in the arm. There is a wheel of stops attached to the underside of the stage via a lacquered brass screw. Francois Soleil was in business from 1812 to 1846, but microscopes signed by him are unknown at the time of this writing. He was followed by his son, Jean Baptiste and the business was then given to Jean Baptiste's son Henri in 1849. The business of Jean was carried on initially at 7 rue de Nazareth from 1823, then from 1825 at 35 rue de l'Odéon, but changed to 21 rue de l'Odéon in 1851; his son Henri was apparently with him at the same latter two addresses and was managing the business starting about 1849 through about 1879. 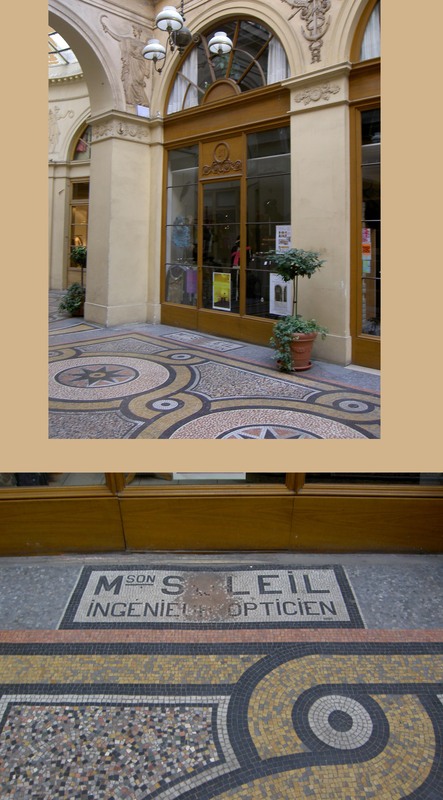 The Soleil business was also operated at some point from the 'fashionable' Vivienne gallery in Paris as is evident from the accompanying photos kindly supplied by Jeroen Meeusen. I am greatful to Jeroen for much additional information found on this web page, and the images of the Soleil Solar microscope. All the known Soleil microscopes are signed either with 'H. Soleil', 'Soleil Fils', or simply 'Soleil.' The pocket microscope was apparently being made by Jean Baptiste as mentioned by Dr Donné (reported to the French Academy of Science) in 1840. It was also mentioned in the 1842 edition of the 'Yearbook of Facts in Science and Art' quoted below. See the table below for a summary of names, signatures, years working and locations. The 1867 catalog of Henri Soleil lists 'various achromatic microscopes' ranging in price from 25 to 200 fr but does not elaborate further on any particular model. In this catalog polarizing instruments including polarizing microscopes are listed individually, and from this and other sources it appears that polarization apparatus and non-microscopical optical equipment such as opthalmoscopes, laryngescopes, etc. were more important facets of the Soleil Business by that point in time. The Soleil firm was famous for optical instruments and accessories especially those having to do with polarized light, including the 'Soleil Compensator,' and other devices using polarized light like the Sacharimeter, polariscope, etc. 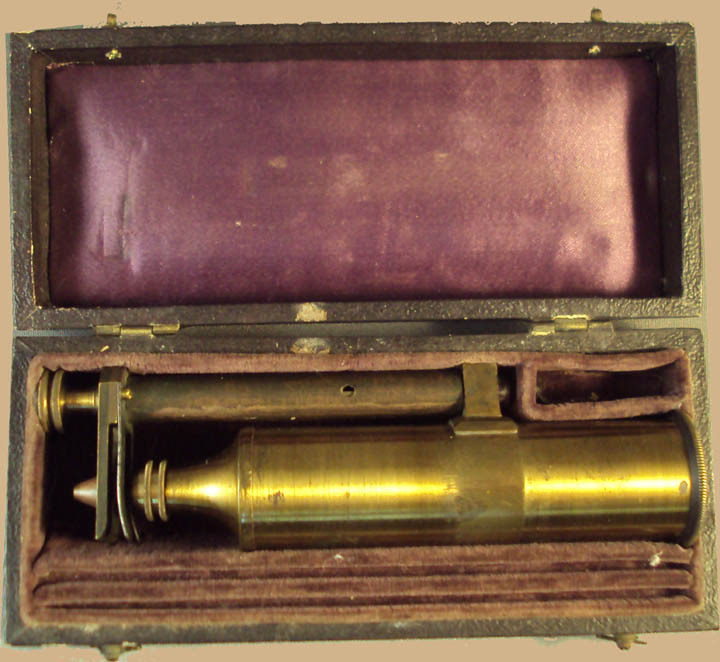 A photographic exposure timing device, then referred to as an actinometer was invented by Soleil about 1842 and variations of this instrument are still used today to measure intensity of various kinds of radiation. Soleil microscopes are rare. I am aware of three examples of the pocket version without stand, one of the pocket version on a stand, a small table model of more traditional French construction, a solar microscope, and two polarizing instruments, each of the latter of different construction. As mentioned above, other optical instruments by the Soleils are well known. Although some (late) Soleil catalogs exist, and briefly mention microscopes, no details of these are given in any of the ones I have had the opportunity to review. 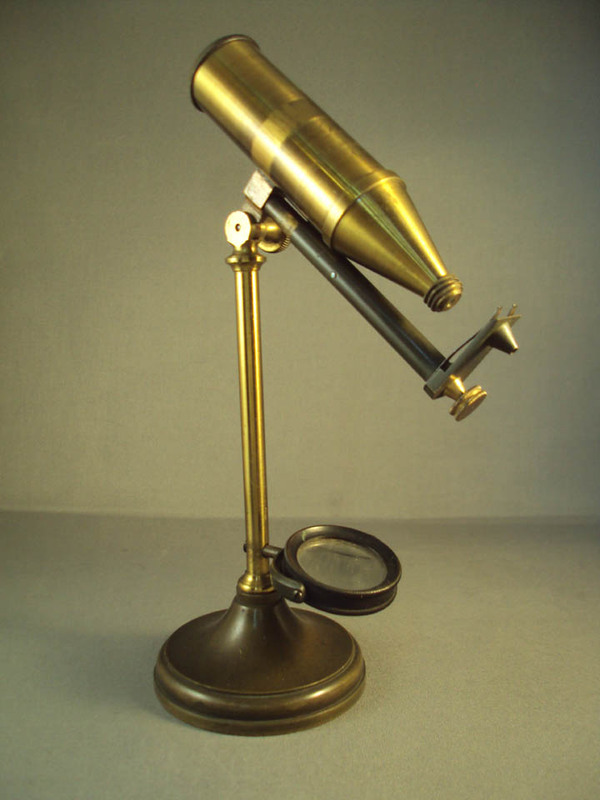 In fact, I have never been able to find a single engraving of a Soleil microscope in any reference. All but one of the microscopes by Soleil in this collection are signed Soleil some with an address either on the instrument or in the lid of the case, but none have a first name or initial. The polariscope in the Golub Collection has the initial 'H' for Henri. The solar has the signature 'Soleil fils' (which translates to 'Soleil Son') and gives the earlier 35 rue de l'Odéon address, dating that instrument to before 1851 since Soleil was at 21 rue de l'Odéon by 1851. In the case of the pocket microscopes without stand, two of the three known examples are simply stamped in block letters SOLEIL and have a seal with the address 'rue de l'Odéon' (without a number) stamped in gold on the silk of the inside of the lid of the case. 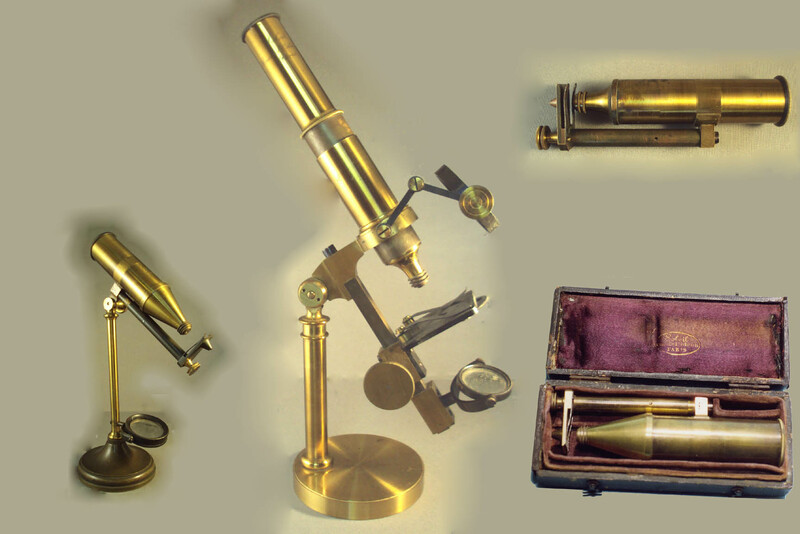 Based on the literature mentioning Soleil Pocket Microscopes starting in about 1840, these examples of the Pocket Microscope date to between about 1840-1851, perhaps even later, but based on the known signatures used by Henri, it is my opinion they date to the time period before Henri was alone. The third example, of almost identical construction and with an almost identical case, has no signature on the microscope and no seal in the case, presumably to allow retail sales by others. The following table summarizes all the Soleil microscopes familiar to this writer. The author is very grateful to Jeroen Meeusen for his kind permission to use some of his images, and for bringing to my attention some of my errors in my initial transcription of some of the signatures. I would also like to acknowledge the help of Francis Gires who was so kind as to let me use his images from the www.aseiste.org site; these two microscopes are part of the collection of the lycée Guez de Balzac à Angoulême, France. The above mentioned quote describes the Pocket Microscope on Stand as pictured here on this website quite well. Dr Alfred Donné mentions a photomicroscopic apparatus made by Soleil about 1840, and also mentions a Soleil Pocket Microscope in an address to the French Academy in 1841. In the 'Comptes rendus hebdomadaires des séances de l'Académie des sciences, Volume 13 By Académie des sciences (France), Centre national de la recherche scientifique (France), mention is made of a 'Pocket Microscope' by Soleil on page 1206. It would seem that the Pocket Microscope of Soleil was certainly made by 1841 and that Jean Baptiste Soleil was the first maker of the Soleil Pocket Microscope. All the examples of Soleil microscopes that I know of are listed in tabular form in the table above, but I would be greatful for any additional examples, information, etc.